Elegant and beautiful! AAAA Japanese freshwater cultured pearl pendant necklace! These AAAA white freshwater cultured pearls are measured at 12.0mm, harvested in the cold water just off the northern part of Japan, they form a glow only offered by a longer growing season. Cultured pearls are perfectly round with very good luster, thick nacre, and clean/smooth surface. They are AAAA quality the highest grade of these cultured pearls. The rareness of the cultured pearl's impressive top quality making them truly one of a kind. 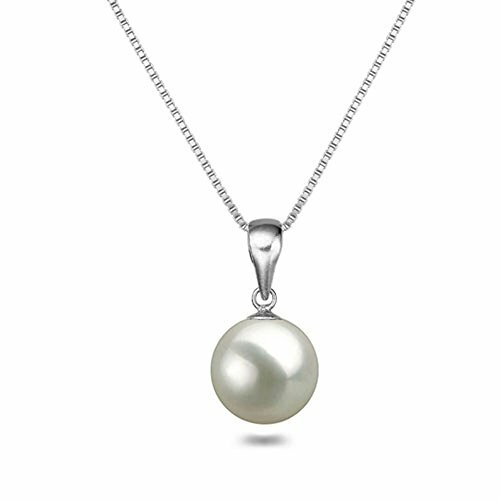 The cultured pearl pendant necklace finished with 14K white gold plated on 925 sterling silver setting and 18 (1.2grams) inch matching box chain. Perfect gift for wedding jewelry, bridesmaid jewelry, bridal jewelry and they are also great gifts for special occasions, mother's day, birthday, graduations and anniversary. This pendant necklace comes an elegant silver leatherette gift box wrapped in a stylish quilted patterned paper to ensure the most beautiful presentation possible and a certificate of authenticity to verify the quality and source of the cultured pearls. All our cultured pearls are certified by GIA (Gemological Institute of America) Cultured Pearls Graduate to make sure the strictest of standards! Japanese AAAA Freshwater White (natural color) cultured pearl measured at 12mm and perfectly round! 18" (1.2 grams) 14K white gold plated on 925 sterling silver settings and match box chain! Come with a stylish silver leatherette pendant necklace box with a matching 2 piece outer packer to ensure the most beautiful presentation possible and a certificate of authenticity to verify the quality and source of the pearls! If you have any questions about this product by Orien Jewelry, contact us by completing and submitting the form below. If you are looking for a specif part number, please include it with your message. 14k Yellow Gold 7-7.5mm Pink Round Freshwater Cultured Pearl Bunny Pendant 1/100cttw Diamond, 15"
14k Yellow Gold 7-7.5mm Dyed-black Round Freshwater Cultured Pearl Bunny Pendant 1/100cttw Diamond, 15"